MACON, Georgia (41NBC/WMGT)- 2 middle Georgia state college students are going against the odds of film making. C1 3 b15 two middle georgia state college students are going against the odds of film making. 41nbc's rashaad vann has more on thier story. 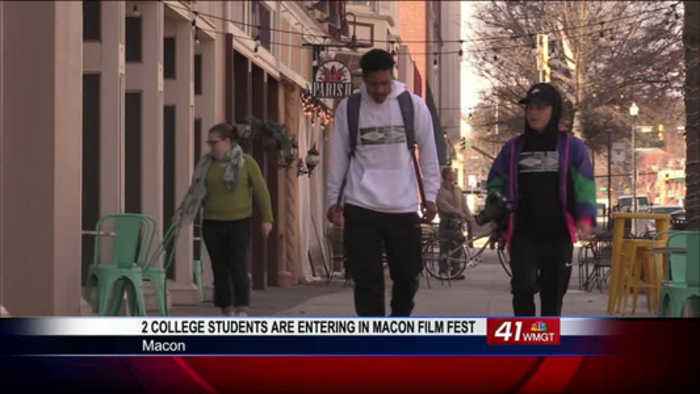 Rashaad... phillip wheeler and jelani perkins are creating their first independent film...the two college students are entering the 2019 macon film festival to be nominated as one of the best films. sot: what i got right now, i just, i have a photography business, so i use what i have with the camera. The programs and all that and i really just use that for my film and progress and advertise and that too. Vo: college student phillip wheeler is not letting any obstacles get in his way of creating his first film... sot: "you always have to sta inspired, you, you always have to want to accomplish more than you are already currently going through." Vo: both students hav been working on their first film for 4 years now... the positive attitude and dedication keeps them going... sot: even though you may not know what's ahead keep pushing." Vo: while studying in college and getting assignments completed... they also find the opportunity to work on the film... sot: "we are really passionat about what we do and what we really want to perceive to the audience" vo: phillip wheele and jelani perkins' independent film is called euphorica ... a short film that's about the dark side of substance abuse and substance addiction. Sot: "we know it will ope doors, we know the macon film festival is the first step in doing so and to accomplishing our goals.